Attach Plus makes securing your e-mail second nature! "Very easy to use, and provides clients with a service that we could not perform without AP"
Attach Plus adds a button to your e-mail application's "Select Files" dialog window. From the "Select Files" window you can attach the file "as-is", convert it to an Adobe Acrobat PDF or compress it into a ZIP file. On the same screen you can secure the file by selecting a password and choosing only the pages you want and attach. It's that easy, efficient and secure! Merge PDF - Combine documents to one PDF with customized Bookmarks! Print to PDF and Attach - Automatically converts the document to an encrypted PDF then attaches to a new or existing e-mail. The PDF is saved in the Sent Mail folder of your e-mail program. 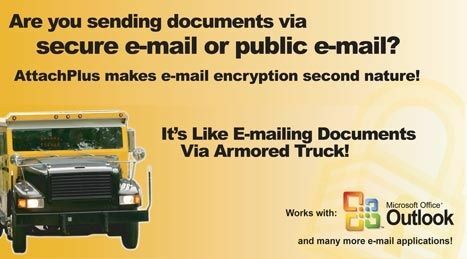 Print to PDF, Save and Attach - Automatically converts the document to an encrypted PDF, saves PDF to your system, then opens a new or existing e-mail. The PDF is saved in a folder and in the Sent Mail folder of your e-mail program. Merge PDF - Combine documents from multiple applications with the 'Merge' feature to create one PDF attachment. About.com rates Attach Plus 4.5 out of 5 stars! Satisfied customers can't believe they ever got by without Attach Plus. Go ahead and give Attach Plus a try today with our 30-day free trial. Click here if your mail client is not listed!